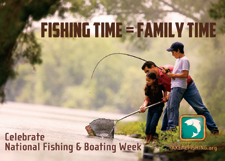 Each calendar year, the Commissioner of Conservation and Natural Resources designates a "Free Fishing Day" for the public to fish recreationally in public waters without a fishing license. Saturday, June 7, 2014, had been designated as Free Fishing Day. You can use this handy map to find a public fishing spot near you in Alabama. Do you like to fish? Where is your favorite "fishing hole"?